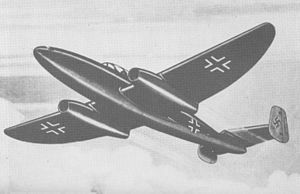 The Heinkel He 280 was the first turbojet-powered fighter aircraft in the world. It was inspired by Ernst Heinkel's emphasis on research into high-speed flight and built on the company's experience with the He 178 jet prototype. A combination of technical and political factors led to it being passed over in favor of the Messerschmitt Me 262. Only nine were built and none reached operational status. The first prototype was completed in the summer of 1940, but the HeS 8 intended to power it was running into difficulties. On 22 September 1940, while work on the engine continued, the first prototype started glide tests with ballasted pods hung in place of its engines. It would be another six months before Fritz Schäfer would take the second prototype into the air under its own power, on 30 March 1941. The type was then demonstrated to Ernst Udet, head of RLM's development wing, on 5 April, but like its predecessor, it apparently failed to make an impression. One benefit of the He 280 which did impress the political leadership was the fact that the jet engines could burn kerosene, which requires much less expense and refining than the high-octane fuel used by piston-engine aircraft. However, government funding was lacking at the critical stage of initial development. Over the next year, progress was slow due to the ongoing engine problems. A second engine design, the HeS 30 was also undergoing development, both as an interesting engine in its own right, as well as a potential replacement for the HeS 8. In the meantime, alternative powerplants were considered, including the Argus As 014 pulsejet that powered the V-1 flying bomb. It was proposed that up to eight be used. By the end of 1943, however, the third prototype was fitted with refined versions of the HeS 8 engine and was ready for its next demonstration. On 22 December, a mock dogfight was staged for RLM officials in which the He 280 was matched against an Fw 190. Here, the jet demonstrated its vastly superior speed, completing four laps of an oval course before the Fw 190 could complete three. Finally, at this point the RLM became interested and placed an order for 20 pre-production test aircraft, to be followed by 300 production machines. Engine problems continued to plague the project. In 1942, the RLM had ordered Heinkel to abandon the HeS 8 and HeS 30 to focus all development on a follow-on engine, the HeS 011, a more advanced and problematic design. Meanwhile, the first He 280 prototype was re-equipped with pulsejets and towed aloft to test them. Bad weather caused the aircraft to ice up, and before the jets could be tested, pilot Helmut Schenk became the first person to put an ejection seat to use. The seat worked perfectly, but the aircraft was lost and never found. With the HeS 011 not expected for some time, Heinkel selected the rival BMW 003. However, this engine also had problems and delays. The second He 280 prototype was re-engined with Junkers Jumo 004s while the next three airframes were earmarked for the BMW motor, which was ultimately unavailable. The Jumo engines were much larger and heavier than the HeS 8 that the plane had been designed for, and while it flew well enough on its first powered flights from 16 March 1943, it was clear that this engine was unsuitable. The aircraft was slower and generally less efficient than the Me 262. Less than two weeks later, on 27 March, Erhard Milch cancelled the project. The Jumo 004-powered Me 262 appeared to have most of the qualities of the He 280, but was better matched to its engine. Heinkel was ordered to abandon the He 280 and focus attention on bomber development and construction, something he remained bitter about until his death. 1/13/1942: Crashed due to control failure. Pilot ejected safely. 6/26/1943: Crashed due to engine failure. 5/1945: Captured at Heinkel-Sud factory complex at Wien-Schwechat, Austria. 10/1944: Struck off charge at Hörsching, Austria. Did not receive any jet engines. Coded as "NU+EB" and "D-IEXM". Flew a total of 115 towed flights. Wikimedia Commons has media related to Heinkel He 280. ^ Christopher, John. The Race for Hitler's X-Planes (The Mill, Gloucestershire: History Press, 2013), p.58. ^ a b c "Janes Fighting Aircraft of World War II" (Random House Group Ltd. 20 Vauxhall Bridge Road, London SW1V 2SA, 1989, ISBN 1-85170-493-0), 318 pp. ^ Dressel, Joachim, Griehl, Manfred, & Menke, Jochen, eds; translated by Dr. Ed Force. Heinkel He 280 (West Chester, PA: Schiffer Military History, 1991), p.15. ^ a b Dressel, et al., p. 15. "Harbinger of an Era...The Heinkel He 280". Air International, November 1989, Vol 37 No 6. ISSN 0306-5634. pp. 233–241, 260. This page was last edited on 13 February 2019, at 22:56 (UTC).